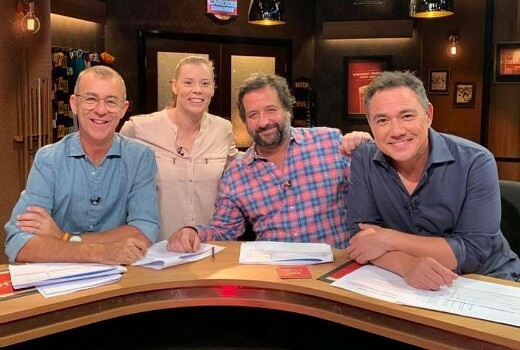 The Front Bar beat the revamped Footy Show last night both nationally and in Melbourne. Seven’s show pulled 400,000 nationally to Nine’s 290,000. In Melbourne The Front Bar was the second most watched show all night, even outranking news bulletins. The 9pm comparison in Melbourne was 278,000 to 193,000. But make no mistake, last night Married at First Sight blew the competition away at a whopping 1.45m viewers, doubling My Kitchen Rules at 738,000 viewers. Hard Quiz on 697,000 and 7:30‘s 593,000 were in third place leaving Bondi Rescue in fourth at 304,000 / 283,000. Australia in Colour again did good business on 300,000 pushing SBS into third place after 9pm ahead of ABC and 10 -a rarity. Nine network won Wednesday with 35.3% then Seven 27.6%, ABC 16.0%, 10 13.7% and SBS 7.5%. Nine News pulled 894,000 / 891,000 for Nine then A Current Affair (797,000), Hot Seat (470,000 / 299,000), and New Amsterdam (245,000 in select cities). Seven News won its slot at 959,000 / 953,000 and Home & Away was 648,000. The Chase was 537,000 / 330,000 and Modern Family was 380,000 / 207,000. ABC News (715,000), The Weekly with Charlie Pickering (604,000), Get Krack!n (279,000), QI (247,000), The Drum (179,000) and Adam Hills: The Last Leg (161,000) comprised ABC’s remaining shows. The Project (431,000 / 249,000) led for 10 then 10 News First (386,000). Pointless was 200,000 with Law & Order: SVU fifth in its slot at just 194,000 / 174,000. Sports Tonight returned to 63,000. Elsewhere on SBS it was Great British Railway Journeys (200,000), Gourmet Farmer (153,000), SBS World News (115,000) and McMafia (112,000). Talking Married topped multichannels at a healthy 264,000 on 9Life. Ugh Ive been one of those people who appears to have been sucked in by MAFS. I have never watched it, I watch MKR but I flick between ads and I think all the drama is dragging me in. I actually watched a full episode last night and recorded MKR. Now of course I will want to watch sunday night because that is when all the stuff comes out. If it’s left you feeling dirty do what I do and just read one of the many MAFS recaps the following day. Get the whole show in just a few paragraphs and without any of the self loathing for being sucked in. James Weir from News.com writes a recap of each episode, very funny, sarcastic, and basically sums the show up as the scripted, concocted rubbish that it truly is. Yes, the MAFS James Weir recaps are absolutely brilliant. Hilariously, savagely cutting and astute. An absolute highlight after watching each episode. Ha Ha ! So true ! Some of those contestants must come close to getting lynched in the street when they come out. Dont know how or why I missed that…good read. Think Ten needs to reboot Big Brother if it wants to remain relevant. They need something that’s for sure. MKR not much higher than ABC News or Hard Quiz. Nice to see Get Krack!n go back up with number of viewers. I really think the ABC are doing The Last Leg a disservice putting it on so late – I’m not watching it live because of this. When it was earlier, it was getting good ratings. I think it’s too full of British politics, of far less interest here. And I hate Adam Hills’ beard! Too full of British politics, funny for a show that’s made in Britain for the British people. And they have covered US politics, European politics and Australia politics. It’s a British topical show, therefore most of its topics are British to a level that most people here won’t understand or have much interest in-could you see a mass UK audience being interested in or able to appreciate ‘The Weekly’? Here’s an idea for The Weekly – replace Charlie and Tom with Judith Lucy, and the show would be a hundred times funnier. Seriously, she got more laughs in her allotted two minutes than the rest of the show managed in its other 25 minutes. A Lucy-led Weekly would be funnier than a Micallef-led Mad As Hell.